Black Avenue Music CEO, Desmond Kwesi Blackmore, known in showbiz circles as D-Black has revealed his journey to the limelight in the Ghanaian music industry. 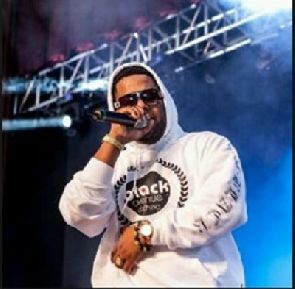 D-Black shared moments with pictures through his senior high school days where he was sacked and had to sleep in the studio for weeks. Growing up in North K with a single mother wasn’t easy. mom was strict & things weren’t as comfortable anymore after my parents split. Had to find a way to make a living. Tried acting lol, working at a nite club, ads & music. Finally in 2009 the breakthrough came. I got kicked out of SSS in Pojoss for breaking bounds n heading to Accra to record with other upcoming artists. I was in a group at the time called Tha Limit. My whole family got pissed! I Ended up leaving home & sleeping in @prodigalofvip’s couch for months. "That project by myself & @KwaObama (Kwaku T) was the best idea ever! We got nominated for the Channel O Awards in Sa , the Ghana Music Awards for Best Video that @GYOGYIMAH shot for us for freeee!! We won Video of the Year at the Vgma’s 2010! Chale it was a dream. "This pic was taken in 2015 and but the guy in is a man named Waxi. Now in 2010, @KwaObama wanted to stop the group thing & work on solo projects. We had a buzz but no money. Waxi met me one day by chance & said I believe in u. Come record in my studio for free. "Waxi said you’re gonna be great D! Let’s work. He gave me his studio and as an engineer recorded 31 songs for me for next to nothing. That’s how I got my first DBlack album. I own 2 studios now but I still go to Waxis studio to work till date. He was my blessing. By the time I finished the Yes Boss Tour , Get on the dancefloor ft. @drcryme and somebody ft. @kwabenalive had blown up Chale. I was a Star now and @BETAwards nominated me as Best African Artist 2010. I was in awe. I was going to America for the first time lol. One thing I ever played with was my brand, my appearance . That sold me . I could be broke cos I’d spend all I had on the outfit for the event. I was a struggling artist but you’ll never know looking at me ever. Wey I fair small too chai. lol. Ok so look guys , I’m not even half or quarter done . I’m telling this story to motivate everyone that has a dream. It’s not supposed to be easy. You’re the only one that can make u. No one can. Ppl along the way will help but it’s all up to. I needed a hit song 2012 Chale . I went to South Africa on a free trip with @ReggieRockstone and he convinced me to do a song in Twi. He said the English alone will limit u. I said naa. He said yes.Gave me 3 hours to write a Twi song , I couldn’t . I wrote pidgin. I wrote a pidgin song, came home & recorded it . I had this young producer come in called @NSHONAMUZICK & he made magic ! I featured my young next door neighbor on the song and I named the song #Vera. D-Black ft. Joey B. That was the biggest song in Ghana in 2012. The new team was set! 4 Childhood friends of mine & 2 others. We all had to shine! Francis (Manager), Breezy (Producer/Dj), Zaro & Fadi (Roadies / Events), Albert (bizness manager) & me. Hustlers with good hearts! We kicked of Black Avenue Muzik & Livewire Events. D Black made the above revelation in anticipation of his new music video that tells Ghanaians a little part of his journey and parts of him that little or nobody knows.